Preventing and stopping wood rot is one of the most important aspects to consider when building a long-lasting deck. DeckWise® offers two deck flashing solutions with our WiseWrap™ line of polyethylene waterproof wood flashing tape rolls. Both products are a self-sealing rubberized peel-and-stick adhesive which prevents wood moisture damage and also self-seals around fasteners. WiseWrap® JoistTape™ creates a waterproof seal when applied to the top of deck joists. Rot is caused by moisture that stays in contact with treated and untreated lumber deck framing and the above decking material. When JoistTape™ is placed between treated (or hardwood) lumber and decking, it prevents water from intruding and stops rot. Use on pressure treated joists or metal joist framing to create a physical barrier that prevents the corrosion from the metal surface caused by contact with the chemicals and oils in lumber. JoistTape™ also acts as a noise reducer towards future squeaky deck boards. 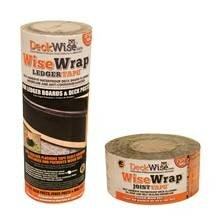 WiseWrap® JoistTape™ retails at $28.98 per 3” x 75’ roll. WiseWrap® LedgerTape®, available in a 12”x 25’ roll, is a flexible polyethylene waterproof ledger board flashing made of the same self-sealing rubberized adhesive material – only wider. Apply this durable, self-sealing LedgerTape® as flashing to protect against water damage on ledger boards from siding runoff and the elements. Wrap in-ground wooden deck posts to provide a barrier against fungi and soil moisture as well as around fence posts and mail boxes or any type of wooden post set in the ground or in concrete. LedgerTape® retails at $35.98 per roll and will wrap approximately 20, 4×4 posts.